Like air conditioning, heating of water can be very expensive affair if not done right. Any heating or cooling appliance takes a lot of electricity and maintaining it at right temperature can save a lot of electricity. Most water heaters are equipped with a thermostat (leaving the good old immersion rods), and using it right can make you comfortable and can keep your electricity bills lower. Thermostat is a device that keeps the temperature in a water heater at desired level by cutting off power supply once the desired temperature is achieved. 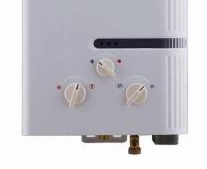 Slightly different from the air conditioner thermostat, job of the thermostat in water heaters is to make sure that the water is heated till a particular temperature and there after the water heater needs to shut off. Thermostat keeps checking the temperature and switches the heater on again, once the temperature decreases. The thermostat makes sure that the water is heated till the set temperature. How do I find a Thermostat in my water heater? Water heaters available in Indian markets are of two kinds: one with thermostat setting visible and is changeable and the other where thermostat is not visible from outside and you cannot make any setting changes. Those with changeable settings have knobs to rotate (as shown in the picture below) to change the temperature setting. Those that do not have changeable settings, mostly have a default temperature setting of 55-60 degree centigrade and have green and red lights to indicate if the water heater is heating water or not. What is the ideal temperature for Water Heater? As per energy savers website good temperature for water heating is 50 degrees (or 120 Farenheight) for all purposes. All water heaters have a temperature range from 40 to 75 degree centigrade. So if you keep thermostat setting to the hottest value, the temperature of the heater would be set to 75 degree. Ideally it is best to keep the temperature knob to the middle or center position for right amount of heating and electricity saving. The amount of electricity consumed by water heater is dependent on the temperature of water coming in the heater and the setting of the thermostat. If the difference between the two temperatures is more then the electricity consumed is more. Many people use a solar water heater in combination with electric water heater as backup to reduce their electricity consumption. The backup of electric water heaters is required for the cloudy days when the sunlight is not sufficient to heat the water. Even for such days, using a solar water heater makes sure that the temperature of water coming in the electric water heater is more and thus electricity consumed is less. Does Thermostat make sure that water heater switches off when the water is heated? Lot of people have a misconception that thermostat makes sure that water heater is switched off when the water is heated. People have a tendency of leaving the water heater “ON” all the time thinking that the thermostat will take care of switching it off when the water is hot. This tendency can lead to lot of electricity wastage. All water heaters loose heat through their body. Water once heated if kept stored in the heater will loose heat and the water temperature will come down. Once the temperature of the water is down by certain degrees, the thermostat switches on the water heater again. The heat loss happens all through the day and so if you do not switch off your water heater, it will keep working all through the day and will consume electricity. Even thermostat uses electricity for its operation (although very less), but keeping it on throughout the day will result in significant consumption of electricity. BEE (Bureau of Energy Efficiency) gives star rating to water heaters on the basis of their heat losses. A “5 star” rated water heater will have much less heat loss compared to a “1 star” rated water heater. In fact unlike all other appliances where star rating is done on power consumption, for water heaters it is done on amount of heat loss (standing losses). Standing losses add to the amount of electricity required for heating by a water heater. Avoid over heating of water in water heaters. Keep thermostat at medium levels. Choose a right sized water heater so that electricity is not wasted in heating extra water that is not required. Choose efficient (5 star rated water heaters). Do not keep water heater on for longer durations. Just switch it on a few minutes before you need hot water and switch it off once your work is done.